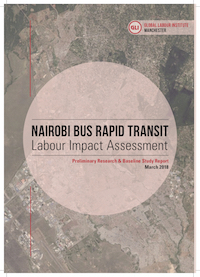 The likely impact and implications of BRT (bus rapid transit) for workers in Nairobi. Good practice examples (e.g. Cape Town, Dar es Salaam) of engagement and inclusion of workers’ organisations in the development of BRT policy and implementation by local, national and international decision-makers. The nature of the worker groups consulted (e.g. trade union, association, cooperative etc). Outcomes of the inclusion of workers’ representatives in the design and operation of BRT. Thanks to the Global Labour Institute for carrying out this research.